Secondly, as mentioned, I was in love with my boyfriend and wanted to marry him with my family's permission and blessings. Initially, my parents and brother didn't agree. They were very adamant and were not willing to accept my love and my boyfriend. I was so stressed because of these events since I could leave neither my family nor my boyfriend. Every single day was a pain to live. I enrolled myself for Mahaparayan and again by Baba's blessings, my parents have accepted my boyfriend and we are getting married on November 23rd 2017. 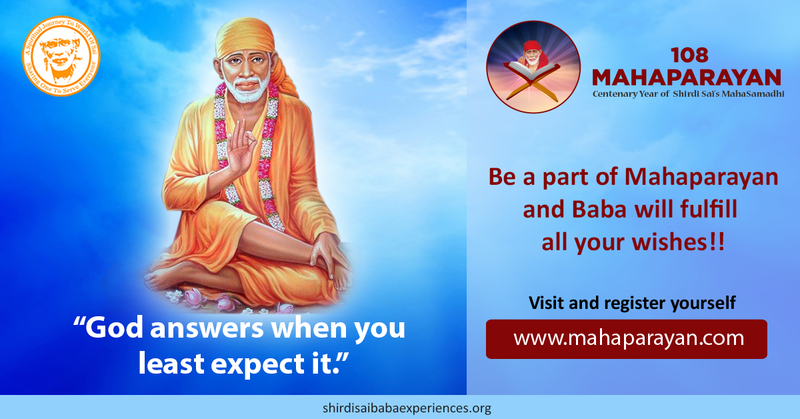 I am pretty sure everything will be fine with Sai’s blessings. I would love to post another experience of Baba which happened during Mahaparayan. As I am working in MNC Bank and my work has lots of pressure. I was very stressed about the job and future. Due to stress and over thinking, I suffered from one side headache and had it for a week. I couldn't eat nor sleep properly. Finally, after reading all the posts in the group and in FB I prayed Baba saying I am surrendering my life to You and please bless me and my husband with good job and a bright future. And I also said please reduce my headache. Next morning my headache was completely cured. This is the Power of Our Beloved Sai, surrender all your sorrows and wishes at His lotus feet and He will surely take care of us. Om Sai Ram. Once we surrender our mind to God completely, He will take care of us in every way. With this surrender comes peace, knowledge, devotion, bliss and salvation as well. Love You Sai Maa. Jai Jai Ho Sai...!